Gordon River Dam was completed back in 1974 and is the tallest dam in Tasmania. 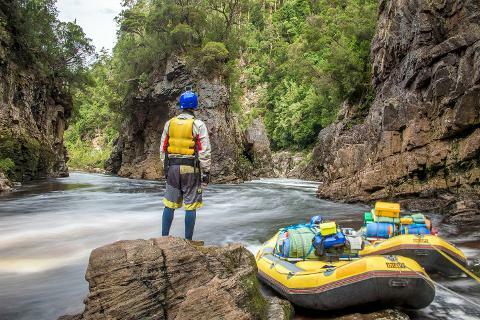 The Gordon River is one of Tasmania's wild treasures. 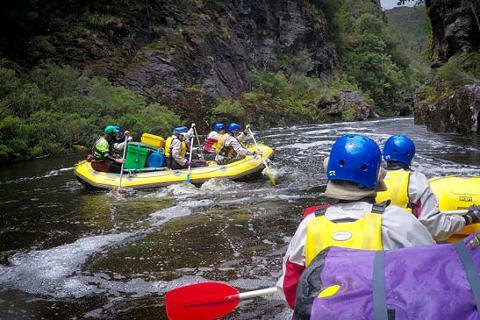 In fact, it is one of the pristine rivers that carve deep gorges into the Franklin-Gordon Wild Rivers National Park. It is home to a treasure trove of spectacular flora and fauna, and it's all there for you to explore and enjoy. Take the spectacularly scenic Gordon River Road all the way to Strathgordon. The road winds its way through the thundering Franklin-Gordon Wild Rivers National Park with incredible views of mountains beyond and deep gorges below. Just 12 km past Strathgordon sits the astounding Gordon Dam holding back the river of the same name. Image thanks to Tourism Tasmania & Wolfgang Glowacki. 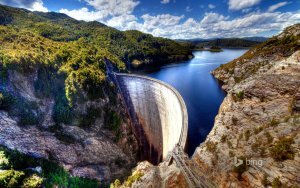 This impressive feat of engineering was completed back in 1974 and is the tallest dam in Tasmania. On your way out to Strathgordon, you'll likely notice the pristine lakes around you. The lake off to your north is Gordon Lake, created by the Gordon dam, and holds the distinction of being the largest lake in Tasmania. The Gordon dam sits in the reaches of the Franklin-Gordon Wild Rivers National Park, so it's not very easy to get to. 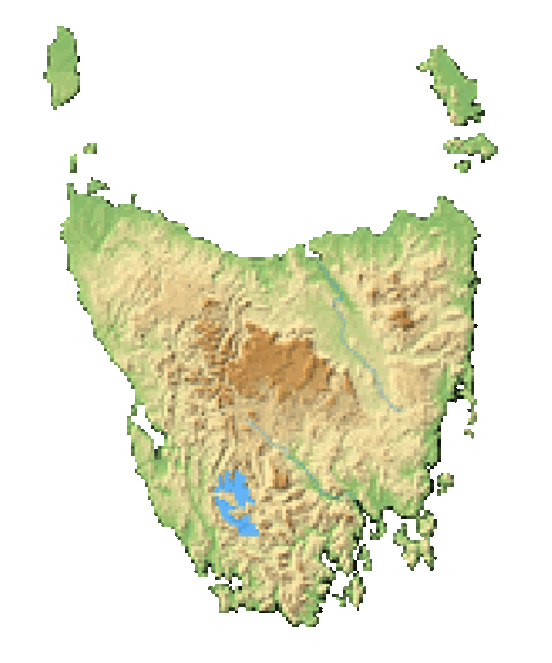 Hobart is over 160 kilometres away and it will take you approximately 2.5 hours to arrive. The drive from Launceston is over 4 hours long while the drive from Devonport will take you 5 hours. You'll have to take the Gordon River Road to the dam and it's out-and-back; there's no scenic loop drive. But, don't worry. The Gordon River Road takes you through the protected Tasmanian World Heritage Area and the Franklin-Gordon Rivers National Park. There are plenty of opportunities along the road to stop for a spectacular view or a short nature walk. It's one of the prettiest drives in all of Tasmania. 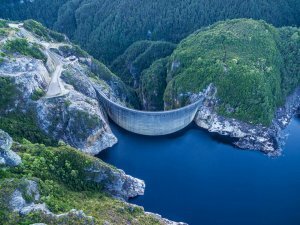 This massive dam stands over 140 metres in height, and the concrete wall features an arch both horizontally and vertically which makes for great pictures from the proper angle. And just think about this when you are walking along the 192-metre length of the wall -- the height of the dam is taller than the Sydney Harbour Bridge and the water it holds back is more than the entire Sydney Harbour. That explains the massive Gordon Lake beyond. Image thanks to Tourism Tasmania and Rob Burnett. The dam descends into the ground 183 metres into the ground to form its power station. It contains 3 turbines that can crank out 432 megawatts of power which produces 13% of Tasmania's energy. The arched wall holds back an astounding 12,359,040 megalitres of water with over 154,000 cubic metres of concrete. It's one of nine double-curvature dams in Australia. The dam was commissioned by parliament in 1963 with a $5 million grant. Construction started in 1964 and the dam was operational in 1978. A third generator was installed in 1988. Engineering fans flock to the Gordon Dam for its impressive size and double curvature. You'll also find plenty of nature lovers on a drive through the Franklin-Gordon National Park and the Tasmania World Heritage Area. But the most extreme visitors to the dam are adrenaline junkies. 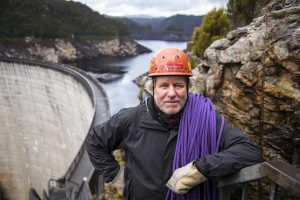 In the middle you have the opportunity to abseil the dam. The 140-metre descent might be hair-raising, but it's the hike back up to the top that might be the more arduous. It's a bit cooler near the dam than most of Tasmania. The temperature can dip below freezing so you'll have to be careful of ice on the roads and dam during winter. The area also receives an impressive amount of rain which gives rise to all the waterways in the area. Always pack some warm clothing that is rain resistant. Located in the heart of Queenstown, this guesthouse is 0.1 mi (0.2 km) from West Coast Wilderness Railway.